The FLIP-FLO Catheter Valve features a 180 degree tap that allows the user or caretaker to drain the bladder when it is most convenient to do so. 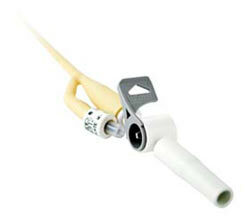 It also helps to maintain bladder tone and capacity by securing the catheter with an easy to open lever tap. Flushing action can also help reduce blockage. This product is designed for urethral or suprapubic catheters. Sold individually - buy as many as you want! I have been using Flip-Flo valves purchased from STL Medical for over a year in place of a bag at the end of an in-dwelling urinary catheter. The product is excellent; no duds or failures. Ease of ordering as well as prompt shipping is excellent from STL Medical. I like this company.